Left: Mall Duff, C2. Right: The tech. We hope that you, following our struggles, fears and possibly success, will find the strength and courage to pursue a dream of your own. The vision of the expedition is to connect pioneers in remote corners of the world with kids and dreamers in their homes over the entire rest of the world via the net. We will try out different technological systems to send information live from the mountain and the summit of Mount Everest to your computer. 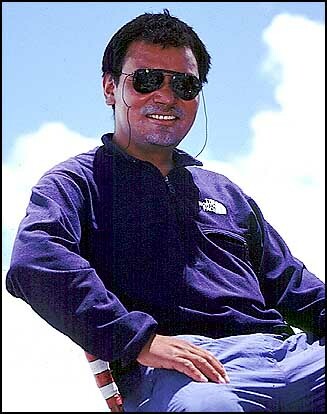 Click on image to view larger: Babu Shirri Sherpa. The plan - Weather permitting, we will make an effort to make an early summit attempt to provide for a second attempt should the first one fail. 1. On the summit attempt, some of our sherpas will climb a day ahead and fix ropes to the balcony. They will then return to camp 4 and stand by there as rescue. 2. The rest of us will climb the next night and fix the ropes from balcony to the summit. On the summit we will leave Babu and return. A sealed oxygen bottle will be left for him for emergency. 3. Dawan, Babus brother, will make a camp at the Balcony (C5) with additional oxygen for security. 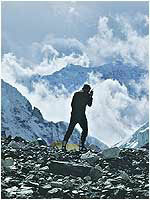 The rest of the sherpas, along with Tom, Tina and Tommy will return to C4 at 8000 meters. 4. There, we will take turns to monitor Babus condition by asking him specific questions on the radios. Additional sherpas will stand by in C2 at 6300 meters. 5. The next day, Babu returns, met by Dawan and the rest of us. We will then continue our descent back to BC together. Click on image to view larger: The technology we are using. The technology - We hope to transmit live from the summit on the internet. The pictures on the summit night will be slow (update approx. every 5 sec), poor quality - but, hopefully - LIVE. They will be transmitted a few minutes every hour during the summit night. There will also be live transmissions before that, from various situations on the mountain. These transmissions will be announced on the site in advance. Climbers: imageseras, communicationboxes, tube antennas and battery supplies - all mounted in the clothing. Click on image to view larger: Avalanche, BC. transportation on the backs of yaks. After that, the equipment will be carried up and down the mountain in cramped backpacks. or breakage on cords and connectors. Wind, avalanches -Especially the antennas and com-boxes in high camps are very exposed. 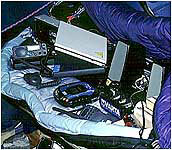 Satellite phone - Weak link and low transmission speed. Server in Sweden - Needs special programs for updates. There will also be additional problems in directing the antennas and also the general fatigue in the climbers, preventing them to perform exact tasks.